Over recent months I’ve seen many bloggers who I admire being nominated for various blogging awards – so it means so much to be on the receiving end of two award nominations as I approach 18 months of food blogging. The Liebster award – First I was nominated for the Liebster award by a fellow Laura at Healthy Made Easy. Laura is French and South African and, like myself, loves to cook healthy recipes from scratch. So if you’re tempted by dishes like date balls, zucchini noodles and quinoa salads then check out Laura’s blog. 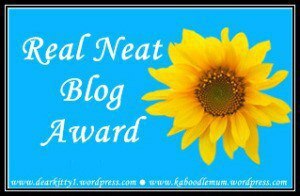 The Real Neat Blog award – The second nomination came from Vanessa at My Gastro Adventure. Again, be sure to check out her blog. Vanessa started her blog with Challenge 52 – through which she is in the middle of posting 52 recipes throughout 2015, all of which have been chosen by her family and friends. What’s your favourite meal of the day? Definitely dinner, I love to sit down with my husband and eat a hearty meal whilst chatting about the day. When did you start blogging? January 2014. What inspired you to start your own blog? / How did you get involved in blogging? I have always loved food, eating out and writing. Friends used to always say to me ‘you should start a blog’. I finally got around to it after a colleague shared with me her blog and gave me tips on getting started on WordPress. What’s your favourite ingredient to use in recipes? This is a difficult question because I have many top pick ingredients. But I’d probably choose lamb meat because it is so versatile and many cuts (shoulder, ribs, shanks) can be slow-cooked with simple herbs and spices. What’s your favourite breakfast recipe? I tend to skip breakfast most days (yes I’m on the intermittent fasting bandwagon) but on weekends when I do indulge I go for a combo of avocado, and eggs, most recently paired with home made paleo bread. Who do you cook for? Normally myself and my husband. What’s your favourite kitchen tool? My hand blender. What’s your number one tip on starting a blog? / What is your best piece of advice for a new blogger? Have a clear vision and philosophy that means something to you and then stick with it. And of course try and choose a blog name that’s aligned to that vision and philosophy. Do you mostly make the same recipes or do you like to try out new ones? I typically have 10-20 of my favourite recipes on rotation at any one time. I’ll try a new recipe every week or so. If it’s a winner add it to the rotation, if it’s average I won’t cook it again. And when I get bored with a recipe or a key ingredient is out of season I’ll drop it for a while. What are you most looking forward to in the next 12 months? Seeing my new apartment (construction is about to start) being built in Manly beach, just 100 metres from the sand. What’s your favourite book and why? It’s a book called The Art of Racing in the Rain and is about a dog called Enzo who is almost human. 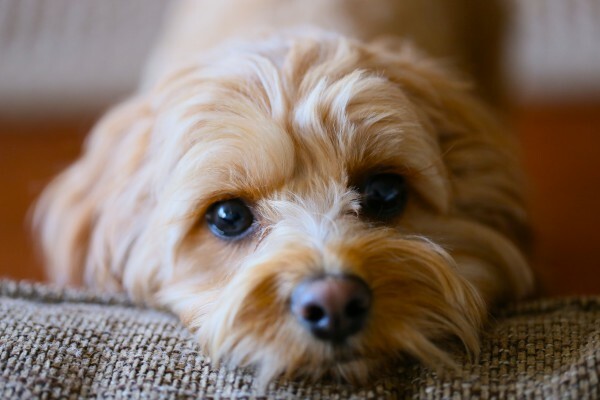 It’s a touching book and extra special to me because I too have a poodle/cavalier cross called Enzo (see image below). If you could only eat one dish for the rest of your life, what would it be and why? Another killer question. I guess I’ll have to put the nutritional content to one side and say ice cream, because it’s the one food I never seem to tire of. Sometimes I wish I would have a ‘I am so over ice cream’ moment but it’s been my vice for over 20 years. If you could live anywhere in the world, where would it be and why? It would be where I have chosen to live right now – in Sydney, Australia, over 17,000km from where I was born in England. It’s a fantastic city surrounded by a beautiful harbour, with world class beaches and a mild climate. And of course it’s also home to amazing fresh local produce and heaps of farmers markets. If you had a dinner party and you could invite any 5 guests, dead or alive, who would you invite? For obvious foodie reasons I’d have Jamie Oliver and Heston Blummenthal (both fellow Brits like myself). Then I’d have Graham Norton to add extra fun (sorry another Brit). Then I’d balance the genders with two Aussie women who are growing old gracefully (to get to their secrets) – Kylie Minogue and Elle Macpherson. What’s the best foodie city you have ever visited and why? What are your top 5 pantry staples? If you could visit one country where would you choose and why? Which well-known chef do you most admire and why? How would you spend the perfect Sunday? Thanks for reading and I look forward to learning more about you all………………. Tags: award, blogging, food, Liebster. Bookmark the permalink. Thank you so much Laura for nominating me! I’m very honored you included me in your list. 🙂 And you won’t believe this but I have met Garth Stein on a number of occasions! He lives here in Seattle and my husband knows him well. Congratulations on your award! Thanks Seana – no problem, I have really been enjoying your blog and it’s funny to have a food connection with fellow bloggers all around the world. I can’t believe your huby knows Garth Stein – pls pass on how much I love his book. He has convinced me that dogs are truly human and my little Enzo is very special indeed (as is his brother Vespa, my other Cavoodle)! Thanks so much Seana – I’ll have to include a picture of his equally cute brother next time! Thanks Amy – yes look forward to your answers! Thanks so much Linda – if my list of nominations could have been two more I would have love to have added your blog – and even better now I know you’re a fellow lamb fan! Congratulations! I’ll have to follow your blog a bit more closely as it takes time wracking the brain for recipes for two! Thanks Grace – I also just followed your blog too! Wow thanks Elaine – I’m a few days behind on reading fellow blogger posts but will check it out ASAP! Thanks Joanna and no problem, I have really been enjoying reading your blog! Thanks Olga! And no probs for the nomination – I too have been enjoying reading your posts, your style of cooking is so homely and satisfying! Thanks Laura for the lovely feedback! Congratulations on your award… I love your blog so I know you deserve it!! hahaha you’re welcome! No, I’m ok with the holiday blues 😀 already looking forward to the next trip!! Thanks Helen and I hope you enjoyed a great trip!